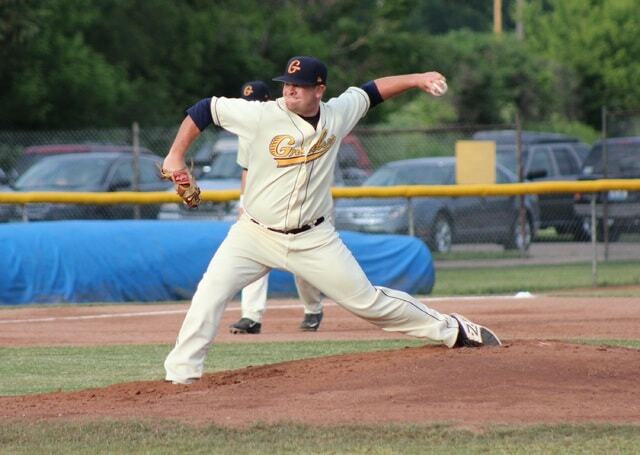 Will Ore lets fly with the first pitch in Galion Graders franchise history on Thursday at Don Edwards Park in Newark. The Graders lost to the Licking County Settlers, 13-4. Galion plays its home opener at 6:05 p.m. Saturday at James D. Heddleson Field at Heise Park. Fireworks will be presented after the game. NEWARK — The three-time defending Great Lakes Summer Collegiate League (GLSCL) champion lived up to its reputation on Thursday as Licking County knocked off the expansion Galion Graders 13-4 at Don Edwards Park in Newark. The Settlers (2-0) benefited from three big innings and a 15-hit attack to pick up their second win in as many nights. Licking County shut out the Lake Erie Monarchs 3-0 on Wednesday to open the GLSCL season under rookie head coach Joe Noro. Licking County scored three runs in the second and seventh innings, respectively, and struck a big blow in the eighth inning, plating five runs to give itself a solid cushion. The Graders (0-1) countered with a pair of runs in the top of the third inning and scored single runs in the fourth and eighth innings. Zak DeCamp had the big bat for the Settlers, going 3-for-5 with a home run and five RBI. He also scored twice. Dylan Calhoun went 4-for-6 and drove in two runs. Will Daniels went 2-for-4, scored three runs and drove in a run. Dustin Lee finished 2-for-4, scored twice and had a RBI. Chad Wagner added a solo home for his only hit of the evening. Despite only three practice sessions together, the Graders hit the ball well against Licking County, pounding out 10 hits. Despite the solid performance at the plate, the Graders were unable to produce timely hits, leaving 11 runners on base. Mark Delas enjoyed a solid debut for Galion, going 3-for-4 and driving in a run. J.T. Core was 2-for-5, scored a run and drove in a run. Brandon Wright, Colton Carney, Hunter Clanin, Alex Malinsky and Tyler Ocker each had a hit for the Graders. Each team used four pitchers on Thursday evening. Tim Mulvey started for Licking County was credited with the win. He worked three innings and gave up two runs on five hits. Mulvey struck out three batters and issued no walks. Nick Patrone, Devin Carr and Brett Kiser each pitched two innings for the Settlers. Galion scored a run each on Patrone and Kiser. Will Ore etched his name in the Graders history book as the franchise’s very first starting pitcher. He threw three innings, surrendered four runs on five hits and took the loss. Ore recorded two strikeouts and a walk. Trent Downs gave up a run in 2-1/3 innings of work. A.J. Cecil was touched for three runs in 1-2/3 innings. Kody Brown gave up five runs in one inning of work. Galion’s home opener is at 6:05 p.m. Saturday against the Southern Ohio Copperheads. It will mark the 2015 season opener for the Athens-based ballclub. The Graders invite fans to stay for fireworks after the game at James D. Heddleson Field at Heise Park. Admission is $5 for adults and $3 for students. Galion Youth Baseball players wearing team jerseys will be admitted for free.